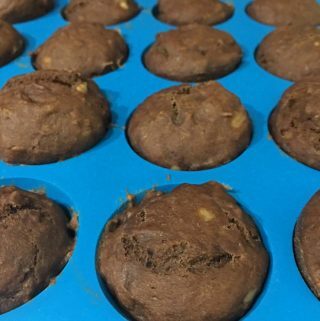 This eggless, dairy free vegan chocolate banana mini muffins are so easy to bake and yummy too. In a large bowl, mix together the dry ingredients - flour, cocoa powder, baking powder, baking soda, cinnamon powder and also the sugar so everything will mix up evenly. In another bowl, mash the bananas very well and add the applesauce, oil and vanilla extract, stir everything very well together until well combined. Add the banana applesauce mixture to the dry flour mixture and stir very well without any lumps to make the batter for muffins. Transfer spoonfuls of batter to the muffin molds, bake for 16 to 18 minutes. Serve the muffins for breakfast or snack, or you may also top the muffins with any frosting of your choice and serve for dessert.